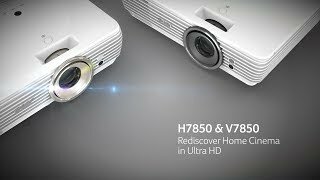 The Acer V7850 4k Ultra HD Projector projector shows movies on a mammoth scale (up to 300 inches or 762 cm in size) in a billion colors and with astonishing clarity. Make your living room your personal multiplex with the Acer V7850, and leave behind the ordinary in entertainment for a cinematic experience that is truly awesome. Already receiving superb 5 star reviews from the likes of UKs top technology magazine T3, the Acer V7850 projector ticks every box and brings top quality 4k cinema at a much more affordable price. The Acer V7850 Ultra HD Projector, projects razor-sharp images with the stunning image quality that 4K resolution brings. With more than 8.3 million on-screen pixels, the V7850 features TI XPR technology, which ensures fine image details come alive. With the prevalence of online video services, premium 4K streaming content is more accessible than ever before. The projector will allow users to enjoy the ultra-high resolution experience on the big screen without venturing out to the cinema. "the Acer V7850 rated 5 star winner: it has an ability to 2160p detail on a huge screen at a pretty low price is one reason to drool over this Acer. Couple that with a lavish colour performance and near -silent operating mode, and you have an easy projector to live with. Overall, the Acer V7850 is a remarkable projector that combines an impressive design with a solid spec and price"
T3 Christmas 2018 - Acer V7850 "Acer hits the Ultra HD sweet spot wiht this high-performance, relatively low-cost eamer that gets just about everything right. Brightness is great and images look razor sharp. Bonus: its fairly small."